Today’s plan was a ferry trip to Videy Island – a nature reserve with beaches, bicycles (free to use) and sculptures, including Yoko Ono’s Peace Tower. We enjoyed a leisurely morning – the ferry leaves at midday, so an early start was not necessary. This suited the 9 year old – bed after midnight and getting up at 10 am is a routine he has come to relish. En route to the harbour we stopped at a couple of shops on the main street. 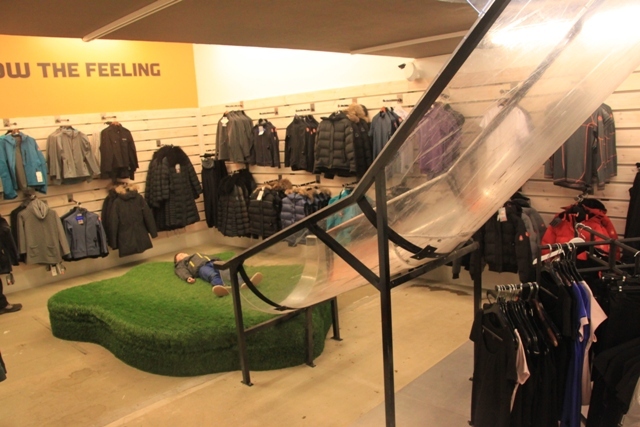 The clothes shops are first class – the price tags match this description, but it is nice to browse. 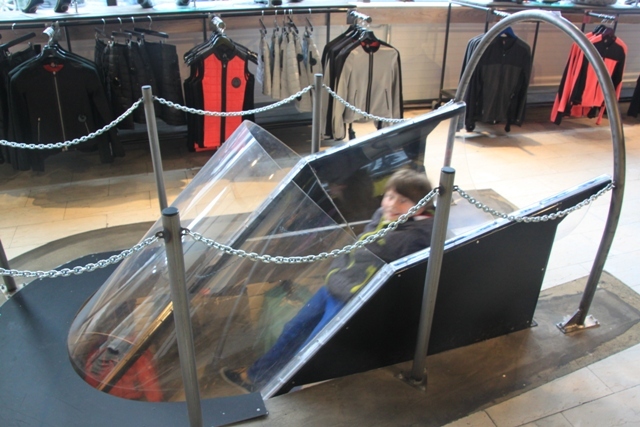 The 9 year old normally detests shopping, an exception was made for this establishment and its novel way of getting to the basement. Down by the habour the winds had picked up, the rain (yet again) was lashing down and a trip to a nature reserve in the middle of the sea for an afternoon of cycling seemed less appealing. We decided to stay on dry land and explore the harbour instead. It was built between 1913 and 1917, before this ships anchored at sea and goods were transported into the city by rowing boat. The old locomotive which hauled away the dredged rocks when the harbour was built is right at the entrance. There were big queues for the whale watching ships – it looked like it would be a rough ride today – braver people than us without a doubt. We contented ourselves with a look at the whale hunting ships – ironically they are right opposite the whale watching vessels. There were two, apparently they have four in total, must have been off catching whales. 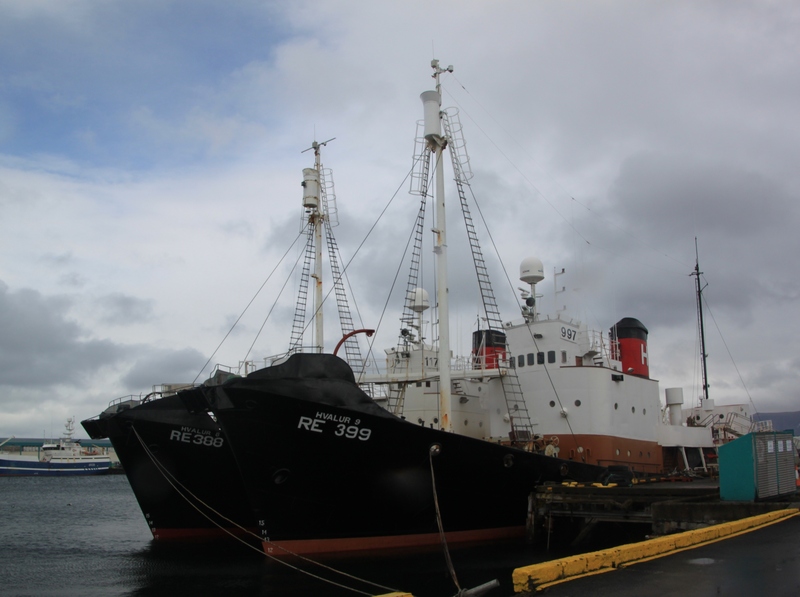 You can’t miss them – huge, hulking vessels but in case of any doubt, they are black and white and have Hvalur on them. As well as a plethora of fishing vessels we also found the two coastguard ships. 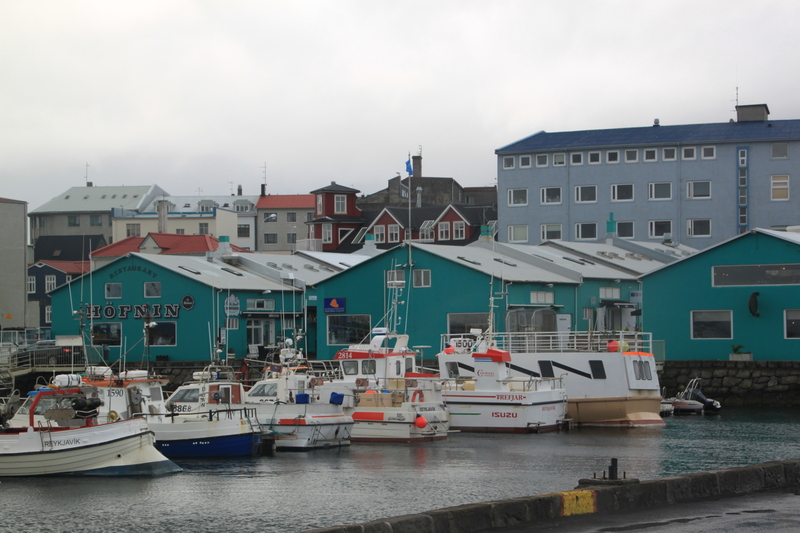 They are also huge, the closest thing Iceland has to a military and are defenders of the country’s fishing waters. They were the slicers of British fishing nets in the 1970’s during the Cod Wars. Inside the old, green former fishermen’s huts are a variety of shops, a museum and some restaurants. We ate in Hofnin on our second evening – a delicious meal and a lovely place. 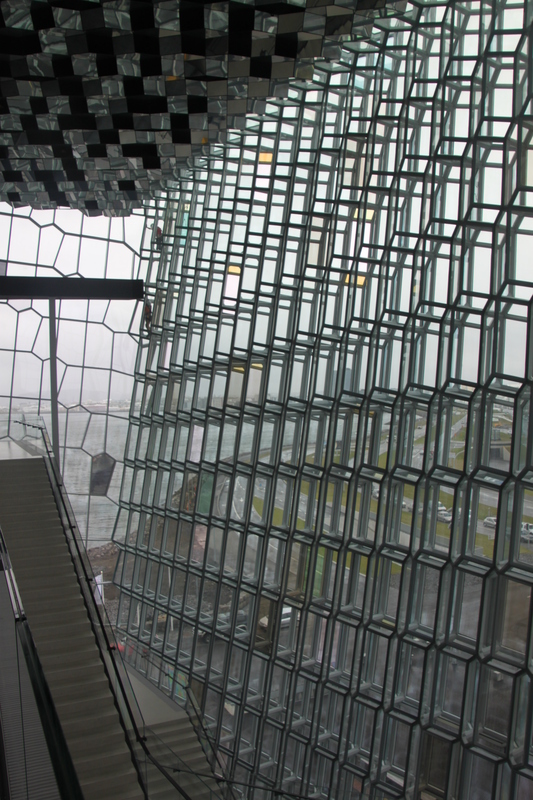 Eventually the weather got the better of us, we sought sanctuary in Harpa, the concert hall and conference centre near the harbour. 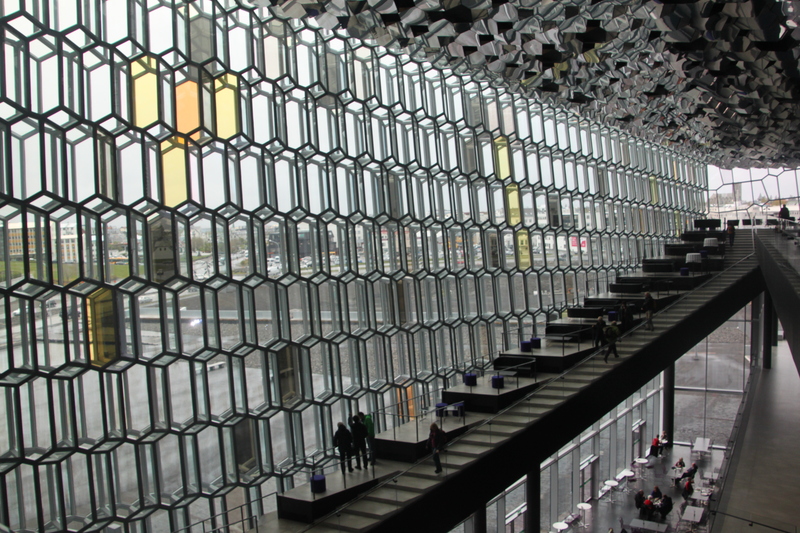 A huge, glass monster of a building – there are 10,000 shimmering windows, we had coffee in the cafe (very nice) and the 9 year old browsed the souvenir shop. He fell in love with a Fuzzy (a seat that looked like a sheep). It was cute, but the price tag was not so cute, so he had to be torn away. Lunch today was at the wonderful Baejarins Betzu, a 70 year old local institution. We can vouch for the fact there are always queues at this tiny hotdog kiosk. We stood in line in the rain and waited – if it is good enough for Bill (Clinton), it is good enough for us. They are proud of the fact he frequented the kiosk during a trip to Iceland and keep his photo on the wall. Incidentally, it was well worth the wait, the hotdog was delicious. I am not an expert, but this one was seriously good – meaty, full of flavour oozing mustard, ketchup and raw and cripsy onions. A bracing stroll along the sea front walked off the hot dog until again the weather defeated us. 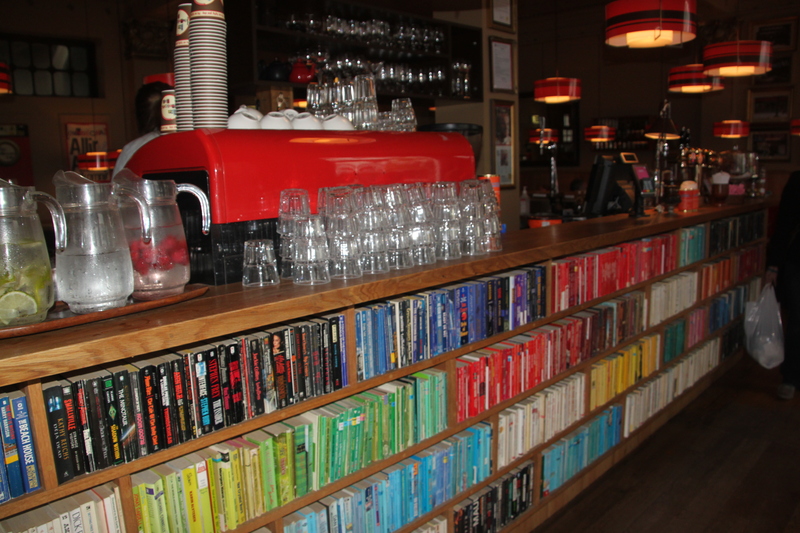 Shelter was found in a great cafe called The Laundromat – shelves of books to read (if you can understand the lingo) and all organised by colour. We took position at a table in the window, ordered beers and watched the world go by. There are worse things to do on a rainy afternoon, it must be said. The 9 year old was happy to find a play area in the basement (as well as a working launderette), so the afternoon passed in a pleasant haze. Thank you! 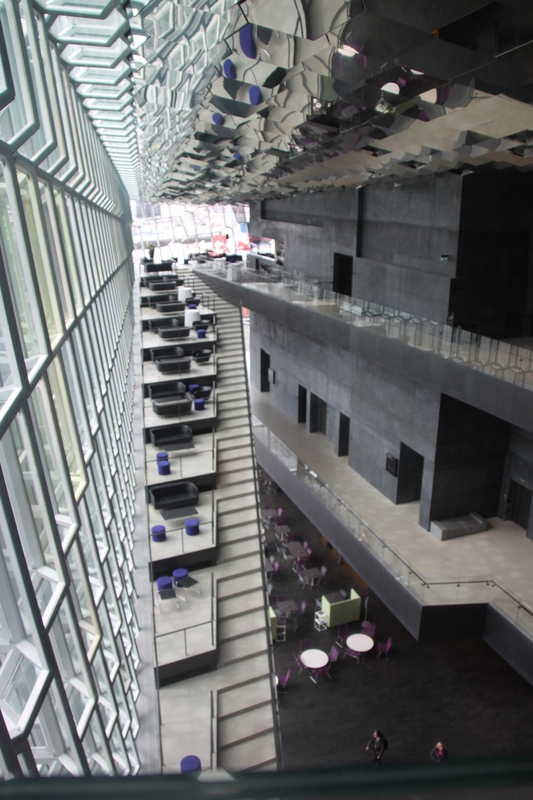 We loved Harpa – have seen lots of other interesting photos of this building, it must intrigue everyone. The Laundromat Cafe was awesome indeed. It was where I had my first meal in Iceland. It’s a fab place, we loved it! Absolutely loved Iceland (we went for our Honeymoon in 2013)! 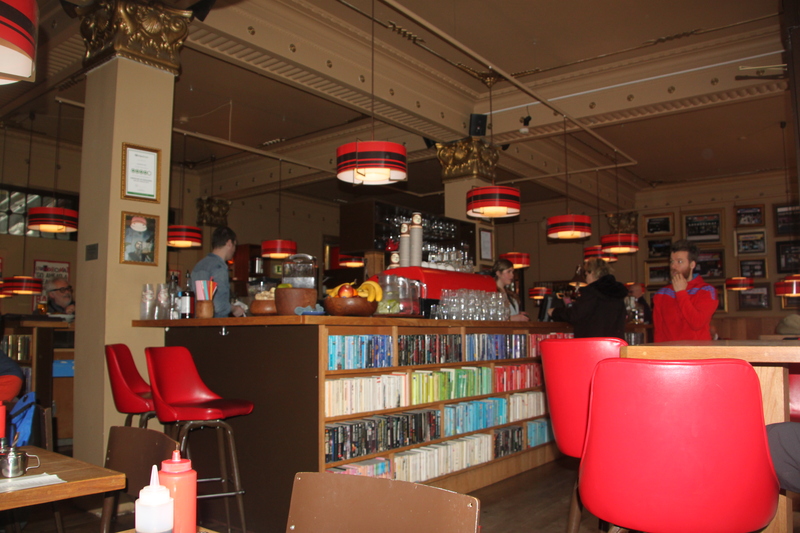 The Laundromat Cafe was great – could not beat their coffee. 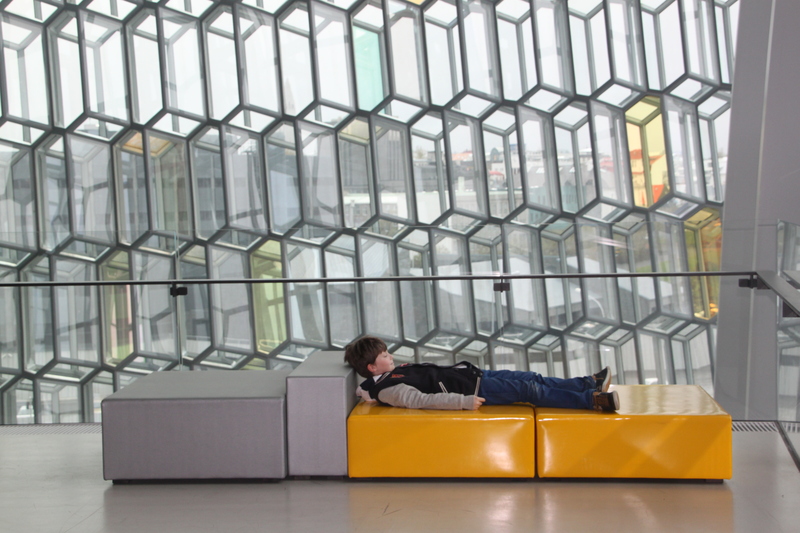 We loved Iceland too – despite the coldest weather ever – such a stunning country with so much to see and do. 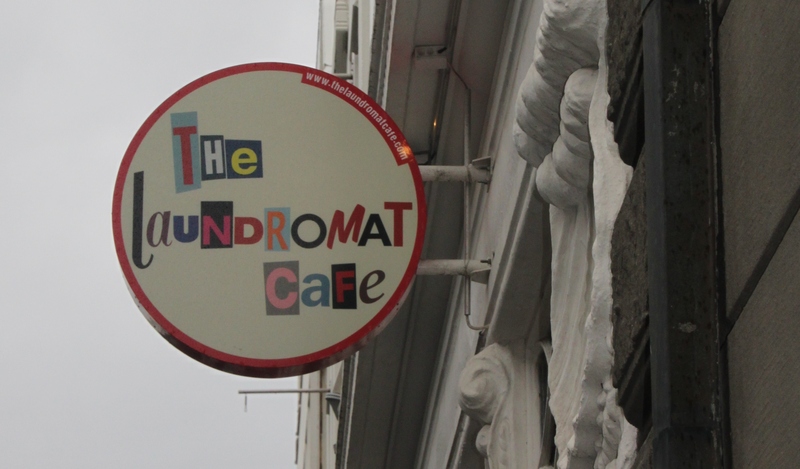 We took refuge in the Laundromat Cafe on a very wet day – great coffee and a great atmosphere, we stayed for a very long time!